When you're beyond busy and dishes are the last thing you want to do, one pan or one pot meals are the way to go! Sweet bell peppers that serve as boats to fill with any flavors you like, and any ingredients you happen to have on hand, are a perfect, satisfying, easy meal to throw together on a sheet pan. In fact, that's this month's challenge from The Recipe Redux - sheet pan meals! These bell pepper boats are a home run in the nutrition AND convenience departments! They offer built in portion control and are loaded with protein, healthy fats, smart carbs, and lots of veggies to make a well-balanced meal any time of the day for the whole family! The flavors in this version are similar to what you'd find on a margherita pizza or caprese salad - tomato, basil, and mozzarella are paired with spinach, herbs, ground turkey and an egg to make a nutritious, delicious, savory meal. I've been having them for breakfast all week! 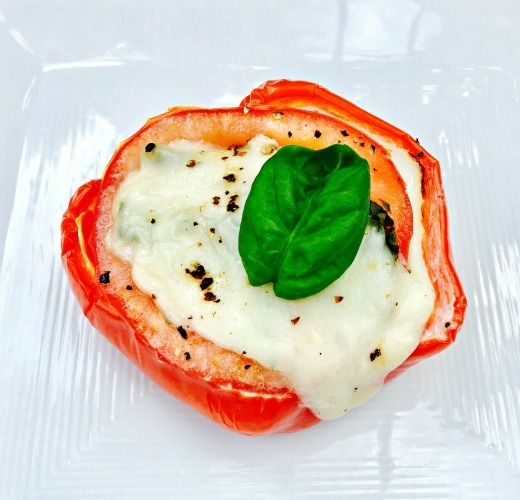 Many stuffed pepper recipes are full of rice, meats and cheeses, so I wanted to give you something a little new and different to work with. You might know by now that I LOVE leftovers. They're featured in this recipe in the form of cooked ground turkey. This is one of the proteins I often cook in big batches so I have it ready to eat when I need it throughout the week; no cooking required. In this case, I just sprinkled in the pre-cooked ground turkey. Other no-cook protein options that would be just as simple: pre-cooked chicken breast, natural deli meats, Canadian bacon or prosciutto, tempeh, lentils or beans! The same goes for all the other ingredients in this recipe. Get creative with the fillings! This can be a fun make-your-own dinner option for the kiddos too! Try any combination of flavors and ingredients to make this recipe new each time! Some of my other favorites mix-ins are mushrooms, swiss chard, kale, salsa, rosemary, cheddar, parmesan, or blue cheese, parsley, cilantro, bacon, etc. Pick your favorite and get stuffin'! Cut bell peppers in half and remove seeds, but leave cores in place. Bake at 375 for 20 minutes. 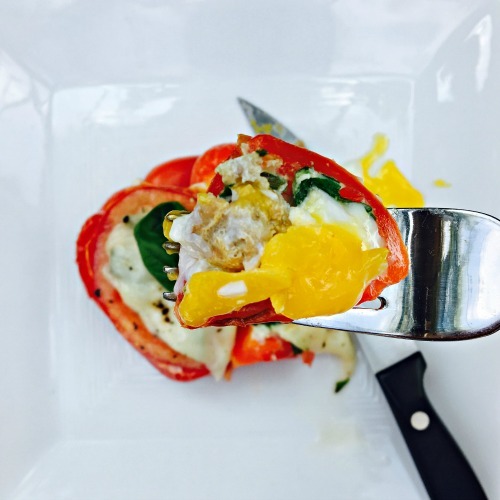 Remove peppers from oven and fill with ingredients in the order listed: spinach, egg, turkey, seasoning, tomato, chopped basil, cheese. Return to oven and bake at 375 for an additional 20 minutes or until egg whites appear firm. Remove from oven, top with fresh basil leaf and season with salt and pepper to taste, then serve! If you try this recipe, use #jeannereillyrd on social media channels to show me your handiwork! Thank you, as always, for following me on Instagram/Facebook/Pinterest and sharing me with all your friends, family, coworkers and strangers on the street. :) I’m have availability for new clients at the moment, so if you know of any individuals or health-focused companies looking for nutrition consultant or coach, send them my way! 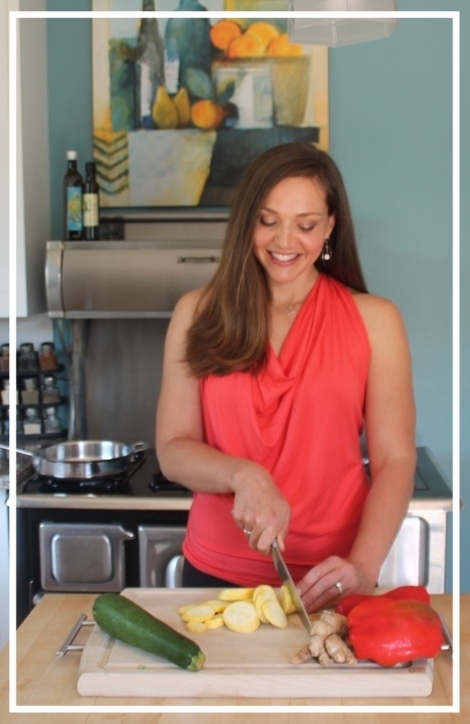 Jeanne Reilly is a San Diego based Registered Dietitian, Mom, nutrition consultant, recipe creator, and health and food writer, helping parents empower their families to form healthy, happy, confident relationships with food. She also works with trusted brands as an ambassador and storyteller to share their message with her audience. Sign up with your email to receive tips directly from Jeanne. 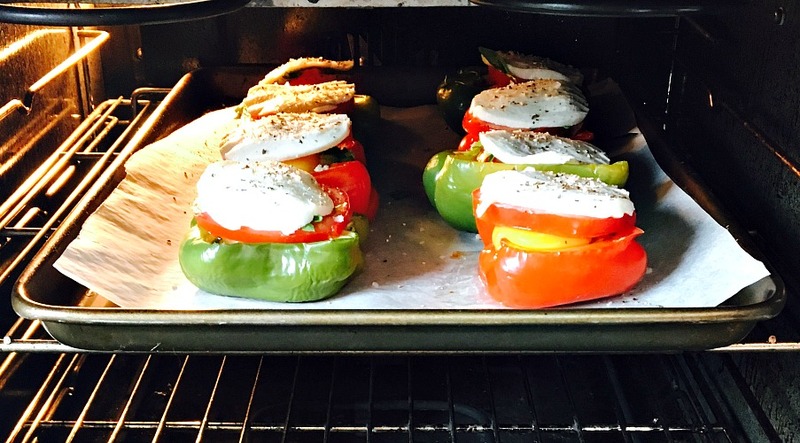 See what Jeanne's cooking today!